The Indiegogo campaign to get Juliet Landau’s A Place Among the Undead (APATU) made, a vampire documentary starring genre headliners including Tim Burton, Anne Rice, Gary Oldman, Robert Patrick, Willem Dafoe, Charlaine Harris and Joss Whedon, ended on Nov. 28, 2015. The initial financial goal of the crowd funding campaign was $300,000 USD. Shortly afterward, the goal was changed to $65,000USD. The APATU team managed to raise an amazing $106,265 USD; making their project 160% funded by 979 backers. Perks were given for donations ranging from $5 (“Fledgling”) to $20,000 (“The Prince/Princess of Darknes” [sic]). More perks were added during the campaign. No one claimed the most expensive perk, “The Prince/Princess of Darknes,” which entitled backers to a “Co-starring role in one of the narratives. You get to become one of Juliet’s victim’s on screen” and everything at the Initiate, Golden Vampire and Lost Boys & Lost Girls levels. The highest-selling perk, “Legion of the Undead Master,” attracted on backer to pay $6,500USD to be “in Juliet’s entourage @ LA premiere” and to “Attend after party and mingle with cast, crew and producers!” Flights and stay were not included. Forty-five people claimed the cheapest perk, “Fledgling.” For $5USD, backers will receive a “Digital UNDEAD gif/video”. To pull off this successful campaign, the APATU team extensively utilized social media and managed to get a ton of media coverage on multiple websites. At one point, the Indiegogo campaign was even trending on Facebook, a feat difficult to pull off. It also managed to get 4,600 shares on Facebook too. We were able to make to exclusive arrangements for Vamped; an interview and a Hang w/ Q & A session, where Deverill Weekes, Landau’s husband a APATU co-director, asked Landau questions submitted by fans to our Facebook groups and pages (see “Further Reading”).Their Facebook group, “Landau’s Legion,” was key for promoting available perks and new ones that were being added daily. We also helped out by making the official A Place Among the Undead Facebook group. The other important tool for their successful campaign was Hang /w, “a live social video, made for sharing any moment from anywhere at anytime for any reason.” Since Sept. 28, 2015 the APATU team managed to post a hundred and twenty-one broadcasts on their channel. The videos help promote their documentary and drive people to the site to buy perks. The film is slated for release in Fall 2016. Indiegogo campaign: Juliet Landau, “A Place Among the Undead,” Indiegogo, 2015, accessed Dec. 2, 2015, https://www.indiegogo.com/projects/a-place-among-the-undead#/. archive.is link: https://archive.is/MK4rY. Subsequent perk descriptions and quotes are taken from this website. The APATU team managed to raise an amazing $106,265 USD: Despite wrapping up on Nov. 28, 2015, the project is still receiving funding and more backers; figure was correct as of Dec. 6, 2015. A Place Among the Undead Facebook group: https://www.facebook.com/groups/aplaceamongtheundead/. 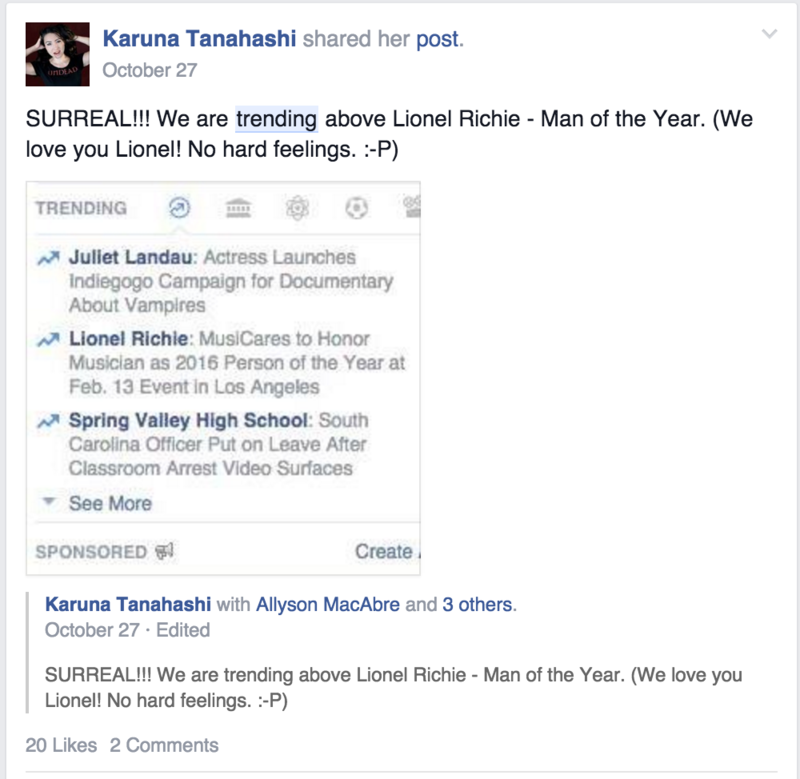 trending on Facebook: Karuna Tanahashi, post on “Landau’s Legion” Facebook group, Oct. 27, 2015, accessed Dec. 1, 2015, https://www.facebook.com/groups/LandausLegion/permalink/932723160098551/. was Hang /w: “Questions?,” Hang /w, n.d., accessed Nov. 21, 2015, http://www.hangwith.com/faq. post a hundred and twenty-one broadcasts: julietLandau [Juliet Landau], “julietLandau wants to hang w/ you,” Hang w/, 2015, accessed Dec. 2, 2015, https://www.hangwith.com/user/julietLandau/564e8e21e4b01353f448c459. Erin Chapman, “Interview with Juliet Landau, Director of ‘A Place Among the Undead,’ “ Vamped, Oct. 28, 2015, http://vamped.org/2015/10/28/interview-with-juliet-landau-director/. Erin Chapman, “Vamped Exclusive: Live Q & A with Juliet Landau,” Vamped, Nov. 28, 2015, http://vamped.org/2015/11/28/vamped-exclusive-live-q-a-with-juliet-landau/.